I tried this morning and .. works! The hashtags are tags used by the major social networks. They are formed by a hash sign this: # followed by the word you are looking for. 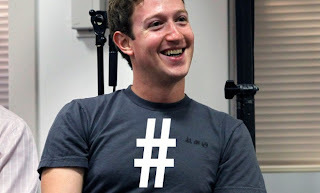 The hashtags on Facebook will be retroactive, ie the research work with hashtag already applied to the written word. "Every day hundreds of millions of people use Facebook to share their thoughts or moments more 'important. To give more visibility' in conversations, we launch a series of features that highlight some discussions. Starting today, the hashtag on Facebook will be made clickable" tells the company in Menlo Park with an official note. Definitely an interesting innovation on the web. Ho provato stamattina e.. funziona! Gli hashtag sono dei tag usati dai principali social network. Sono formati da un simbolo cancelletto questo: # seguito dalla parola che si cerca. Gli hashtag su Facebook saranno retroattivi, cioé funzioneranno le ricerche con hashtag già applicati alla parola scritta. "Ogni giorno centinaia di milioni di persone usano Facebook per condividere i loro pensieri o i momenti piu' importanti. Per dare maggiore visibilita' alle conversazioni, lanciamo una serie di funzioni che evidenzieranno alcune discussioni. Da oggi, gli hashtag su Facebook saranno cliccabili", fa sapere l'azienda di Menlo Park con una nota ufficiale . Sicuramente un'interessante novità sul web. Che dire: sotto con gli hashtag, allora ! !